Pests on your crops are a nuisance regardless of the type of operation you have, aquaponics or otherwise. As aquaponics farmers we are strictly limited to pest control that are non-chemical, non-toxic and harmless to our fish. An integrated pest management system is essential for any size operation which is designed to target specific pest for specific crops. Due to recent hot weather in the lower mainland we have experienced a small cabbage looper infestation that has affected our first butter lettuce crop. The cabbage looper (Trichoplusia ni) is a member of the moth family Noctuidae. It is found throughout the southern Palaearctic ecozone, all of North America, parts of Africa and most of the Oriental, parts of Europe and Indo-Australian region. 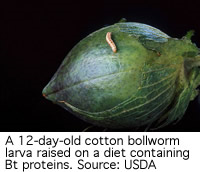 The caterpillar, a measuring worm, is smooth and pale green with white stripes and is one of a many species called cabbage worm. It is called a “looper” because it arches its body as it crawls, inchworm-style. This species is very destructive to plants due to its voracious consumption of leaves. It is not restricted to cole crops; other plant hosts include tomato, cucumber and potato. The adult of the species is a nocturnal brown moth. After much research into pest control we looked at a biological insecticides a bacteria strain called Bacillus thuringiensis (Bt) that provides proven control of Lepidoptera pests in many crops. Lepidoptera is a large order of insects that includes moths and butterflies. Bt has to be eaten to cause mortality. The Bt toxin dissolve in the high pH insect gut and become active. The toxins then attack the gut cells of the insect, punching holes in the lining. The Bt spores spills out of the gut and germinate in the insect causing death within a couple days. ven though the toxin does not kill the insect immediately, treated plant parts will not be damaged because the insect stops feeding within hours. Bt spores do not spread to other insects or cause disease outbreaks on their own. 1. Insect eats Bt crystals and spores. 2. The toxin binds to specific receptors in the gut and the insects stops eating. 3. The crystals cause the gut wall to break down, allowing spores and normal gut bacteria to enter the body. 4. The insect dies as spores and gut bacteria proliferate in the body. Bt action is very specific. Different strains of Bt are specific to different receptors in insect gut wall. Bt toxicity depends on recognizing receptors, damage to the gut by the toxin occurs upon binding to a receptor. Each insect species possesses different types of receptors that will match only certain toxin proteins, like a lock to a key. It is because of this that farmers have to be careful to match the target pest species with a particular Bt toxin protein which is specific for that insect. This also helps the benifical insects because they will usually not be harmed by that particular strain of Bt. A product called DiPel manufactured by Nufarm is what we used to control the infestation. DiPel is the number one biological insecticide in the world. 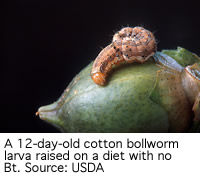 This potent Bacillus thuringiensis (Bt) insecticide provides proven control of Lepidoptera pests in many crops. Its balanced blend of four active toxins, plus a natural spore, provides exceptional control. This varied list of active toxins also makes DiPel an effective resistance management tool. DiPel can be applied in conventional or organic systems. Because it is Exempt from Tolerance, DiPel gives grower’s full confidence when selling crops to foreign markets. In addition, DiPel’s superior, high-potency, dry-flowable formulation ensures the longest shelf life of any other Bt on the market. Harmless to any fish species. Eliminate chemical insecticide residue on food crops. No worker re-entry interval restriction. Ideal for an Integrated Pest Management System (IPM). Provides the best possible control conditions for beneficial insects such as honey bees. As “activator” to enhance efficacy of chemical insecticide. One of the few insecticides approved for organic use (OMRI listed).